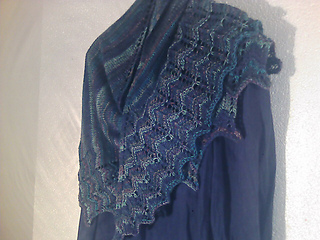 Skywave shawl is an asymmetric triangular shawl / scarf worked sideways with cascading chevron lace edge. 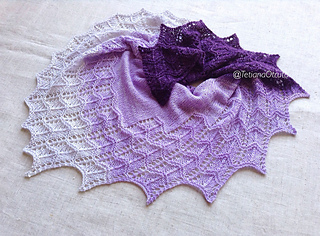 Pattern includes several variations of the shawl pattern. Version 2: whole chevron shawl plus additional tips for stripes layout. deepest point relaxed after blocking. 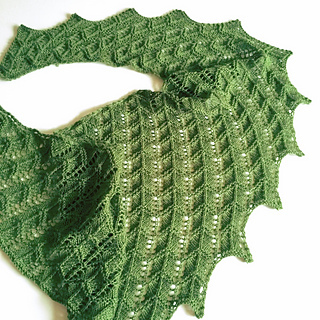 The shawl size is easily customizable by adding or taking away pattern repeats. Skills: knit, purl, basic lace knowledge. This pattern includes written instructions only and stitch count tables. 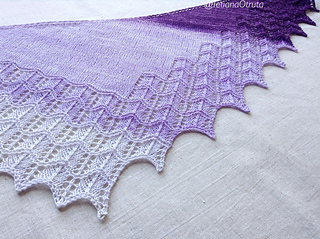 Pictures show the shawl in Stroll Gradient Dazzlepants (Version 1) and Chroma Twist Sugar Cookie (Version 2).